In 1800 before modern farm machines were developed, about 90 percent of the entire US population was employed on the land. They had to harvest crops manually i.e carrying out a series of laborious operations one after another; fast-forward 200 years and you'll find about 2 percent of people are now working as agricultural workers. What caused that amazing change in society? One important thing was the development of huge, automated farm machines such as combine harvesters that made each agricultural labours vastly more productive. Let's take a closer look at how combine harvesters work! Combine harvester, or simply combine, is a combined machine designed to efficiently harvest, thresh and clean a wide of grain crops. The name is meant to its combining three separate harvesting operations - reaping, threshing, and winnowing - allowing farmers to collect their crop yields into an intensive single process. Among the crops harvested with a combine are corn (maize), soybeans, flax (linseed), oats, wheat, or rye, barley, sorghum, sunflowers, canola and among others. The waste straw, left lying on the field, comprises the stems and any remaining leaves of the crop with limited nutrients left in it: the straw is then either chopped, spread on the field and ploughed back in or baled for feed and bedding for livestock. This is the most economically important labour saving inventions and material resources and it enables to greatly reduce the burden on farmers. Combine harvesters have helped the mechanization of harvesting that takes a lot of time and a lot of people, we call it as the most labor-intensive processes in rice farming. 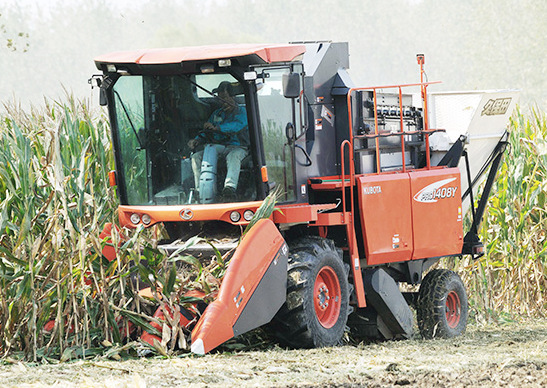 A combine harvester is able to reduce labor and increasing efficiency. 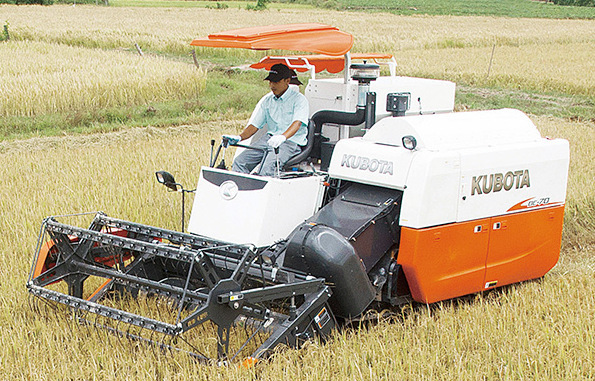 It is applying its refined crop farm machinery technologies to develop solutions for farmers. It offers advance technologies to support as many farmers as possible to produce even one more extra agricultural crop. First the farmers had to cut down the crops with a long-handled cutting tool such as a scythe. The second step, known as threshing, namely they separate the edible grain from the inedible chaff by beating the cut stalks. The last process, they had to clean any remaining debris away from the seeds to make them suitable for use in a mill. Fortunately, the whole job of harvesting ca be done with mechanical devices or large equipment, namely modern combine harvesters. Farmers simply drive them through a field of crops and they cut, thresh, and clean the grains all by themselves using rotating blades, wheels, sieves, and elevators. The grain collects in a tank inside the combine harvester (which is periodically emptied into carts pulled by tractors that drive alongside), while the chaff spurts from a big exit pipe at the back and falls back down onto the field. It saves time and labour. The field can be used for the next crop with in a very short period. The quality of product harvested is maintained because it is not damaged by natural and biological activity. One gets premium price of the product if harvested at an appropriate time. 0 Response to "How a Combine Harvester Works"